Our city, Christchurch, was shattered by Earthquakes over 2010/2011. This was followed by the Kaikoura emergency of 2016. We have seen teams of emergency response workers using clipboards and cameras during the immediate response, and throughout the rebuild. We knew it could be done better. Clarinspect as designed to be robust, to work on and offline, and to integrate into a wider effort. This, and the innate adaptability, is what makes Clarinspect the tool of choice for pulling a coherent emergency response together. The origin of Clarinspect is in the need to capture situational information, and images, during an emergency such as an earthquake. This was one of the original use-cases we came up with having seen emergency response workers using clipboards and cameras during the Christchurch Earthquakes of 2010/2011. These forms combine the best of structured data capture for rapid damage assessment with the utility of a mobile device - images and GPS positioning. Residential Report: Rapid Assessment output report for building earthquake damage assessment. Residential Report: Earthquake damage section of output report for building earthquake damage assessment. 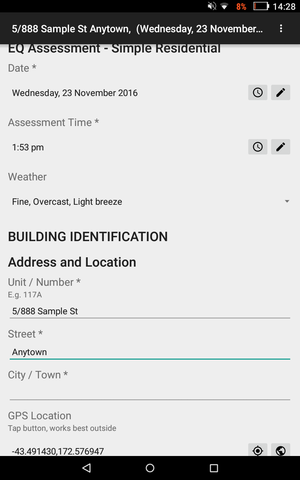 App: Damage assessment section of rapid residential building assessment. The Christchurch branch of Harrison Grierson, an innovative New Zealand engineering and design consultancy, have been using Clarinspect software over 2016 for Site Snag and Defect Reports, Pre-Pour Inspections, and Construction Monitoring. Shortly after the North Canterbury earthquakes in November, some of the Harrison Grierson staff redirected their focus to urgent recovery work in the Kaikoura area, starting with inspection of wastewater and stormwater assets. The origins of Clarinspect reach back to the series of earthquakes that shattered Christchurch. I was out for lunch with two colleagues, Mark and Tom, on Feb 22, 2011 when the small in scale yet giant in impact earthquake hit just 5km below our hometown of Christchurch.